You’ve got yourself all wrapped up and covered against the elements, but what about your bikes? 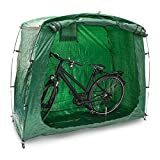 Keeping the rain off your bike at home and when you’re out camping means no more soggy seat, and no frame or mechanism damage from rain, sleet and snow. 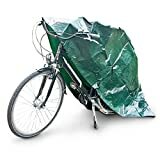 Simple roll-down flap, the Relaxdays is made from a durable garden tarp material, which is great for keeping water out.